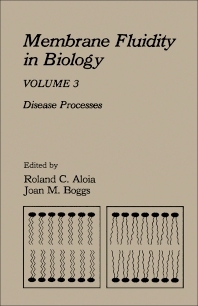 Membrane Fluidity in Biology, Volume 3: Disease Processes focuses on the relationship of membrane lipid alterations and membrane fluidity to various pathological conditions, providing unique phenomenological conceptualizations of disease states. This book compiles comprehensive reviews on topics such as respiratory distress syndrome, diabetes and receptor function, muscular dystrophies, atherosclerosis, alcohol-membrane effects, and lymphocyte function and cancer. This publication also evaluates the interplay between membrane lipid alterations and membrane fluidity and abnormal cellular function, emphasizing how possible alterations in membrane lipids and cholesterol, and consequent changes in membrane fluidity can influence normal cellular activity and lead to pathological cellular function. This volume is intended for molecular and cellular biologists, clinician-scientists struggling with an understanding of the mechanisms of pathological processes, and biophysicists seeking research problems in pathology to study.